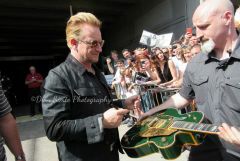 Happy Birthday Bono!! Hope it was a good one! As for me, in-between jobs and watching too much tv. Someone gave me a box of Ferraro Rocher chocolates because they were on sale...a nice surprise. Haven't gotten my copy of the North Side Story yet but it was ordered 1/22 so it might be a few more days.